Work begins at Ballymena Showgrounds. Ballymena Showgrounds will still serve as the finals stage for this summer’s SuperCupNI - but extensive renovation work has forced organisers to relocate the showpiece games to an alternative pitch within the venue. 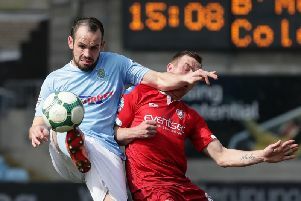 Welcome work started in May by Portadown-based pitch experts Haffey Sports Grounds is expected to be finalised for the start of Ballymena United’s Danske Bank Premiership campaign. However, officials have confirmed a degree of disruption to July’s SuperCupNI youth football tournament programme but with assurances that plans remain in place to protect the finals at the site even if alternative venues are required for some fixtures. A spokesperson for Mid and East Antrim Council said: “The resultant work will give a high-quality playing surface and also ensure that European dimensions are achieved. “We are working with SuperCupNI organisers. “It is likely that some matches that would normally have been played on the arena will be relocated to other venues. The showpiece finals traditionally held at the Showgrounds in front of large crowds are now set to be moved from the arena to one of the other pitches at the sports facility. Speaking about the work, Mayor of Mid and East Antrim Councillor Paul Reid said: “I am delighted the programme of extensive work on the pitch at Ballymena Showgrounds is under way. “This will improve drainage and the quality of the playing surface to ensure it meets European standards. “Ballymena Showgrounds is a multi-use venue and the Council continues to work closely with all users to ensure it remains one of Northern Ireland’s premier facilities. “In the past year the venue has hosted several top sporting events, including the SuperCupNI, UEFA Women’s Under-19 Championships and World Stock Rod Championships.